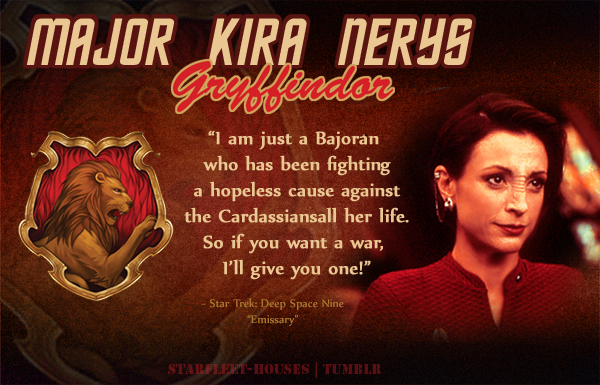 Kira Nerys - Gryffindor. Hot-tempered, complex, fiercely loyal to her people, easy to frustrate, and on a constant crusade for revenge and justice from the Cardassians, Major Kira is sorted into Gryffindor. Wallpaper and background images in the nyota Trek: Deep Space Nine club tagged: deep space nine star trek ds9 kira nerys nana visitor bajorans treek meets hogwarts.